Our researchers believe price cycles and our proprietary Fibonacci modeling system is suggesting the US and Global stock markets may be entering a period of price rotation very soon. 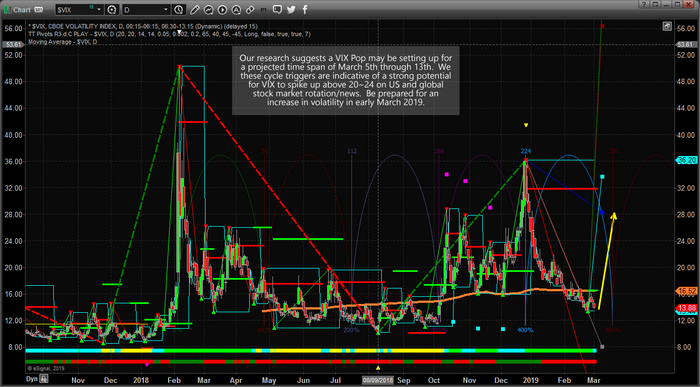 Our team of researchers has identified a date span of between March 5th to March 13 as a range of dates where we expect the VIX to form a bottom and begin to rise sharply. Our researchers believe this current rally in the US stock market is a bit overextended, even though the markets appear to be drifting a bit higher currently. We believe the US stock market is due for a healthy price rotation/correction sometime near the middle of March that will allow new price valuation and momentum to build for a continued upside price move. Currently, we are expecting Technology to be the biggest rotation of US majors. In other words, we expect the NQ, NASDAQ and Technology stocks to take the biggest hit while this price rotation takes place. This would make sense as new price valuation levels (lower) in technology would allow for a solid momentum base and renewed accumulation going forward. Plan and prepare for this expected rotation by pulling some of your profits from any long trades while being aware that downward price swings are often 3~7x faster than upside price swings. Our expectations are that we will see general price weakness beginning near March 5th and a strong likelihood that the VIX will rotate above 16 as this volatility begins to increase. Overall, we believe any VIX move above 20 will likely start to form a support/momentum bottom fairly quickly.